Thanks here go out to both Bill (wahorgr) and Steve (silicondale) who helped resolve this with their input. It occurs that the ONLY option which works is that of selecting the one where you give a URL link to where it is stored (direct upload from your machine or upload from a URL doesn’t work). So it’s the 3rd option to select as shown below. Note carefully also the paragraph specifying the very restricted size and dimension limits imposed for the image. I used the website https://postimages.org/ to store my image. To get the correct link you have to right-click select the image (0n the postimages page) and ‘select link’ … then paste it into the browser bar (in a new tab) and the image alone will appear. 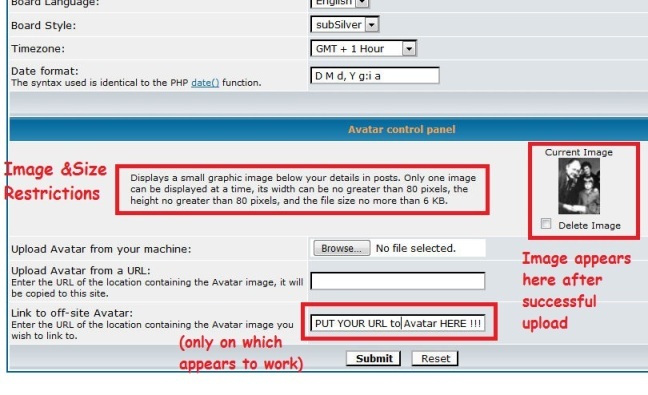 In the case of postimages the link is ‘secured’ (https) and didn’t work when used to upload the avatar. As an educated (I use the wrìord loosly) guess I just tried eliminating the ‘https://’ and PRESTO ! worked like a charm. Alternatively, select the ‘Share’ button on the poatimages page and all the link options will appear. Then Select the ‘Hotlink for forums’ link. … Selecting only the part as highlighted in bold above ! The link cropping need may vary for other online storage sites. A storage site using just a plain ‘www.’ Or non-secured ‘http://’ at the beginning of the link may or may not work without removing. There’s no indication that I’ve found which tells what image formats are acceptable. I’ve tried both .jpg ad .png and both work OK for me. It may possibly be that there are restrictions on some other types of image. If you come back to the Profile page afterwards you’ll see the image uploaded on the rhs in the avatar zone towards the bottom. So, go for it ! … and be as artistic and inventive as the 6kb 80x80p will allow you to be !!! I have increased the limits to 32KB and 256x256. it was just for effect (to try 256x256) .... I've now reduced to 192x192 :O) which fits bang within the previous original 'margin' width, so if you do change I'd suggest this size max would be a good one.